Plugins and Tools for LabTech. 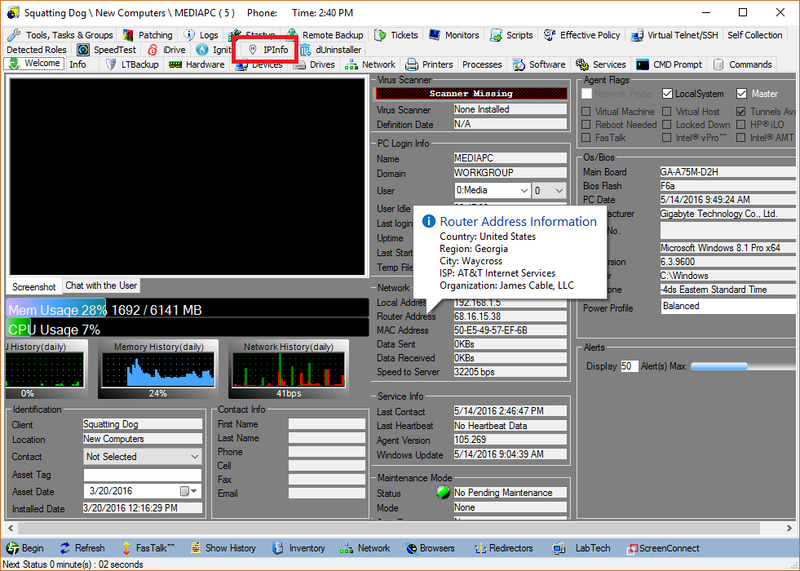 When you have enough clients in LabTech, it’s easy to forget which city a given computer is in and which ISP it’s using. Enter IPInfo. This plugin pulls information from IP-Api.com to show you at a glance information about the router IP address. This helps you quickly identify where the computer is, as well as where it’s getting internet from. Note that this plugin does not track the computer via GPS and that the location information is based on the IP address only. Install the plugin via the Plugin Installer and open up a computer window. If you hover over the router address, a tool-tip is shown with the appropriate information (see below). You can also go to the IPInfo tab to view the full information in a website. For LabTech 11, you won’t get the ability to hover and see the information at a glance, but you do still get the tab to give you the needed information from their website. We’re working on improving this implementation to make it as friendly as LT 10/10.5. Note: The icon used in this plugin was provided by https://icons8.com. Will you be updating IPInfo to the LT 11 interface? Yes. There are some changes in the works for this plugin in the near future. Hello – Haven’t seen any recent activity. Is this plugin compatible with LT12?